“Buffalo Soldier the name given by the Indians because of their short curly hair and their courage and fortitude, much admired qualities of the buffalo. Kiowa Indians in western Kansas after encounters with Black soldiers of the 10th Cavalry Regiment in 1866, gave them their name. It was a compliment by the troops and the 10th Cavalry adopted a picture of the buffalo as its regiments crest. 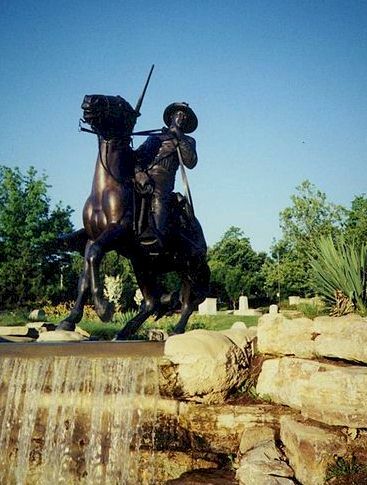 Black cavalry and infantry troops known as buffalo soldiers were sent to the west to take part in the Indian wars and the protection of settlers at the end of the Civil War. In June 1862 the First Kansas Colored Volunteer Infantry was organized by Kansas Senator. In 1866 Congress authorized the formation of two new regiments of Black cavalry with the designations 9th and 10th U.S. Cavalry, and four regiments of Black infantry, designated the 38th, 39th, 40th and 41st Infantry Regiments (Colored). The 38th and 41st were later reorganized as the 25th Infantry Regiment, with headquarters in Jackson Barracks, Louisiana, in November 1869. In August 1866 eight Black companies of the 125th Infantry marched to New Mexico and soon were serving at seven Army forts throughout the territory, most of them in southern New Mexico. In September 1867 they were replaced by six companies of Black troops from the newly organized 38th Infantry who had seen action earlier in the year against the Cheyenne Indians in Kansas. These first buffalo soldiers to be stationed in frontier New Mexico also had many more menial responsibilities. They (as well as White soldiers) were responsible, in some cases for major construction and renovations at the forts where they were stationed and served as carpenters, plasterers, painters, and bricklayers. At Fort McCrae, for instance, Black soldiers built several new buildings, put a new roof on the hospital, and made 25,000 adobe bricks for new officers quarters, which they also built. In the years 1879 and 1880 Black cavalrymen of the 9th Cavalry played a major role in the pursuit of the Apache leader Victorio. They engaged in numerous fights against the Apaches and at least twelve men were killed in action. Eight Black soldiers received the Congressional Medal of Honor for bravery during this campaign. Among their final duties in New Mexico was the closing and dismantling of Fort Selden in 1891 and Fort Stanton in 1896, an indication of the peaceable conditions now reigning in the territory. Here ended the role of the buffalo soldiers in New Mexico in the Indian Wars of the nineteenth century. Here is the 1880 census extraction of Buffalo Soldiers, not a complete list. The first group is of Fort Stanton in Lincoln County.